First, try out this cool interactive map of Aruba. Click on the map to enlarge it. 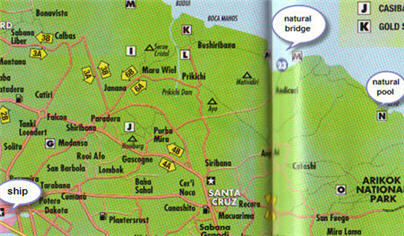 Not only does it give you a good overview over this easy-to-get-around Caribbean island. Clicking on the camera icons launches 360 degree views of Aruba's main attractions! How cool's that? What you'll notice is that there aren't too many roads. Perfect for driving around in your rented car or jeep without getting lost! Aruba is one of my favorite cruise ports of call. You can easily explore it in one day. Whether you plan to travel to Aruba, or ask yourself, "where is Aruba? ", a good map will help you out! By the way, Aruba is one of the Dutch leeward islands, just north of the Venezuelan coast. To get your bearings, check out our map of the Caribbean islands. Last time we were there, I picked up this big map of Aruba and cut it into smaller sections and then photocopied each part. 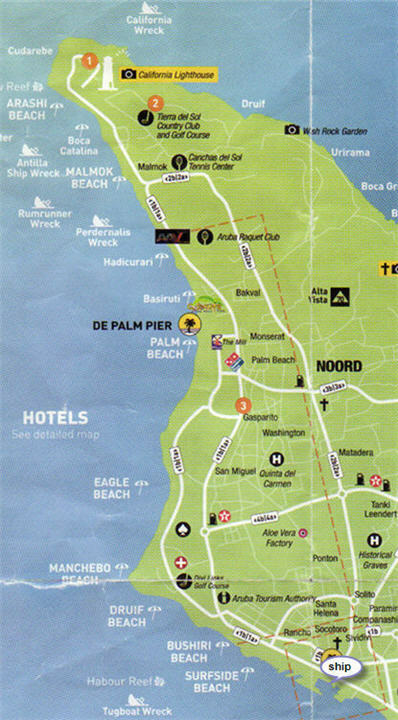 This part of the Aruba map shows the Oranjestad downtown core. 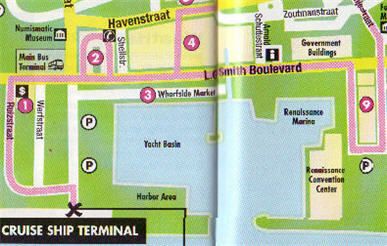 There you find the cruise ship terminal, the shopping, car rentals and the bus terminal. If you are not renting a car, take a bus to the Aruba beaches. The bus ride is nice and cheap. The bus terminal is on the left of No. 2 on the map above. Or take a taxi. The price is per car, so you can split it with others. 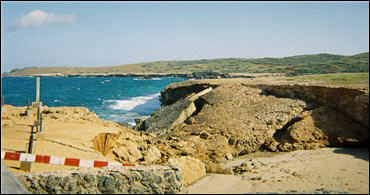 Most of the streets are on the West side and in the center of the island. Once you get to the East side, it's mostly desert and really not much of roads. The rugged East coast is best explored by jeep or quad. 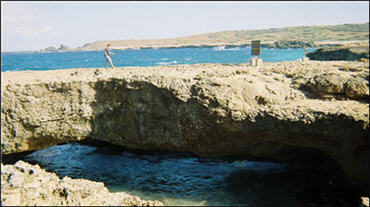 Get a glimpse of Aruba's rough beauty along its East coast with these two pictures of the "Natural Wonders"... natural bridges, formations of limestone, cut out over centuries by the pounding waves. Sadly, the biggest and most famous of the brigdes collapsed in 2005.